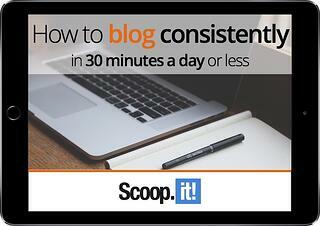 How to blog consistently in 30 min per day or less - download the free eBook! The complete guide to help you scale your content production and get better ROI by adding curated content to your website or blog. Blogging is no longer an option if you want your company to be found online. Issue is, creating good content is time consuming, it requires specific skills and resources, and without inspiration there simply is no content. And most marketers don't have all of that. In fact, for 60% of marketers, creating engaging content remains their #1 challenge. - Why publishing consistently matters. - How to add curated content to your blog in the right way. - The best tehcnique to write highly effective curated posts. - The ROI of scaling your blog through content curation.